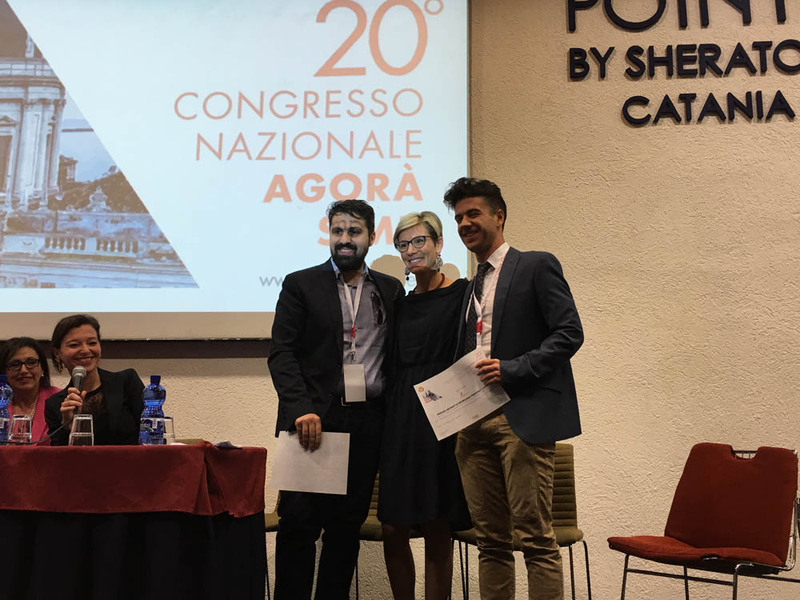 Eu-Brain, at the SIMP congress that was held in Catania in March 2018, awarded the best two scientific contributes on perinatal and neonatal neurology. Here is a summary of one of these interesting studies. Infants life in the Neonatal Intensive Care Units (NICUs), due to their frail condition, are subject to numerous invasive procedures, which, despite daily issues to reduce these to a minimum, are perceived as painful procedures. Despite human beings, including adults, do not have direct memory of the painful procedures, it is well known that painful events may determine biological and neurological reactions in adults but also in younger patients. 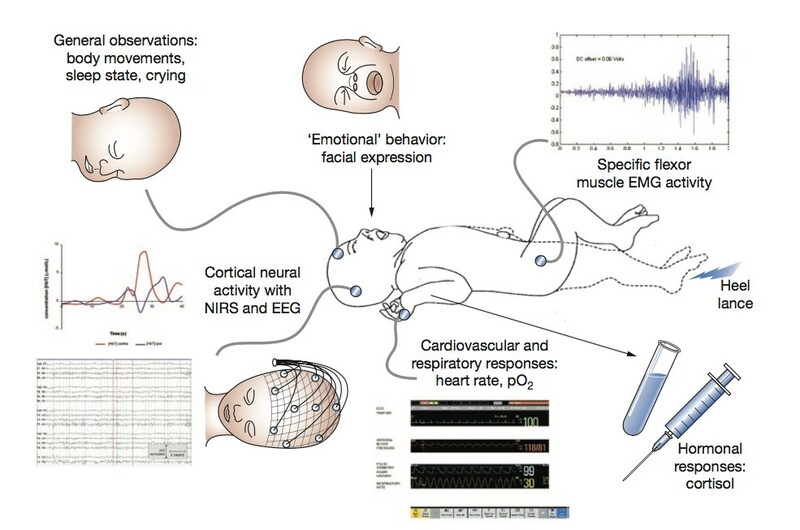 Although newborns were historically (and incorrectly) considered unable to feel pain, various studies, evaluating facial expression, heart beat, arterial pressure, and hormones levels demonstrated that also newborns, including premature babies, have a perfectly functioning pain processing system, also called “nociceptive activity”. We believe it is not correct to speak about “the memory of pain” but we know that children can modify their reactions to painful procedures if they experienced uncomfortable procedures in the neonatal period. Indeed, a pivotal neonatal pain study showed that babies who underwent unsedated circumcision during the neonatal period presented more vigorous and inconsolable crying at first vaccinations, when compared to those circumcised with proper anesthesia. This finding demonstrated that early painful experiences may negatively influence subsequent responses to nociceptive stimuli. Neurologic mechanisms that underlie this process are very complex and mediated by intricate interactions between multiple brain regions. We conducted a study at Giannina Gaslini Institute (Pediatric Hospital) between Neonatal Intensive Care Unit (leaded by Luca Ramenghi) and Paediatric Neuroradiology Unit (leaded by Andrea Rossi) to analyze at least part of these very complicated interactions. We explored functional communications between multiple brain regions using a magnetic resonance technique, called BOLD sequence, that evaluates changes in deoxygenated hemoglobin concentration, thus detecting indirectly the activity on neuronal cells in specific areas of the cerebral cortex. Moreover, the analysis of BOLD studies evaluates which areas of the brain are activated simultaneously, assessing the connectivity of different regions of the brain at the resting state. In this study we performed a BOLD fMRI study in a group of preterm neonates studied at 40 weeks of gestational age and we explored changes in connectivity of all brain cortical regions in response to previous painful experiences, such as surgery, intubation and heel sticks or pricks. Dots indicate cortical brain regions; red and blue connections link brain regions with increased and reduced connectivity in response to painful experiences, respectively. The main finding of the study was that higher number of invasive procedures during the neonatal period is associated with more evident alterations in brain connectivity in specific areas of the brain. In particular, the cerebral regions involved were the posterior Cingulate, the right Pre-Central Gyrus, the left Supplementary Motor area, the left Insular Cortex, the right Insular Cortex, the opercular portion of right Inferior Frontal Gyrus, the right Middle Frontal Gyrus, Cerebellum, left Occipital Pole. Cerebellar connectivity and painful experience. Changes in cerebellar connectivity was observed in neonates who experienced a greater number of painful events during the perinatal period. 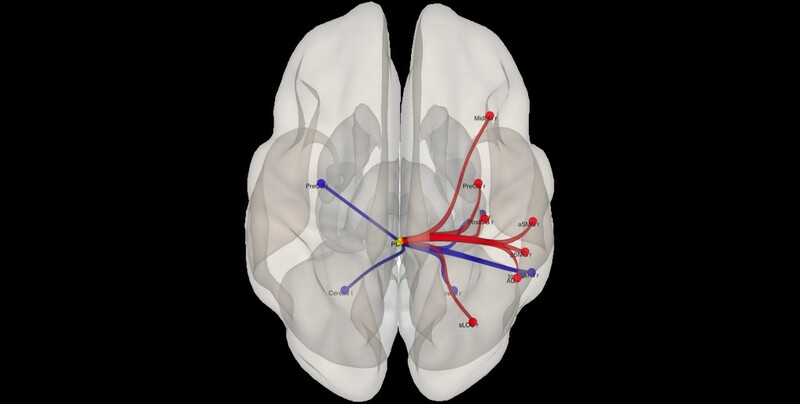 Dots indicate cortical brain regions; red and blue connections link brain regions with increased and reduced connectivity, respectively. Changes in cerebellar connectivity was observed in neonates who experienced a greater number of painful events during the perinatal period. 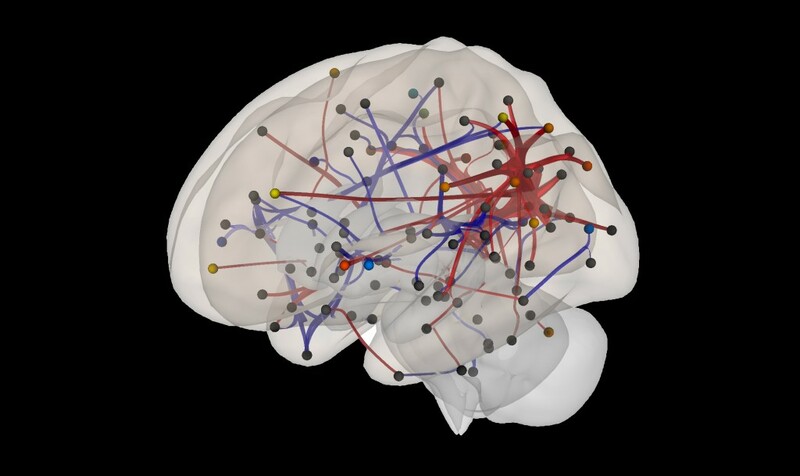 Dots indicate cortical brain regions; red and blue connections link brain regions with increased and reduced connectivity, respectively. Dissimilar from adults, we did not observe any brain connectivity’s alterations in the amygdala and orbitofrontal cortex, areas known to add emotional connotation in pain processing of adult patients. We have demonstrated for the first time how nociceptive experiences can modify brain functional connectivity in neonates during “resting state” even at a distance of time from painful events. As in adults, connectivity of somatosensory areas, insulae and cerebellum, known to be involved in the processing of stress and pain response, seem to be alterated also in neonates. On the hand, potential role in pain elaboration for the posterior cingulate and the lateral occipital cortex seems to be more evident in the neonatal period. It remains very difficult to understand the full meaning of these research findings studying the connectivity of the cerebral cortex of newborn babies during the “resting state” and why these babies showed alteration of cortical activity even so long after painful experiences. It is even more difficult to correlate these functional findings obtained with Magnetic Resonance Imaging to the known clinical and permanent altered reactivity to later painful stimuli observed in other studies. We can only speculate that myelination and cortical folding of the frontal region occurring usually quite late in newborn life could explain the lack of involvement of Amygdala and Orbitofrontal Cortex, that are very frequently inter-connected in adult patients during pain process.